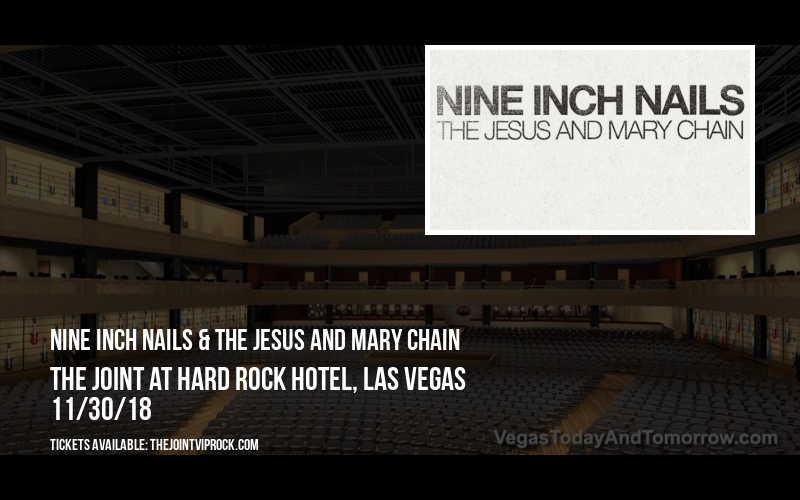 Treat yourself with tickets to the show of the year: Nine Inch Nails & The Jesus and Mary Chain at The Joint at Hard Rock Hotel on Friday 30th November 2018! Escape to your happy place with these hard hitting acts! Get your Nine Inch Nails & The Jesus and Mary Chain tickets today while spaces are still available!! Free shipping and no service charge on all orders. The incredible Nine Inch Nails have been rocking the stages ever since their debut in 1988, led by Trent Reznor, they are one of the biggest bands on the industrial scene. As they begun around their hometown in Cleveland, Ohio, NIN quickly decided that this would be their life purpose to create music and share with the world. By the 1990's they were already well and truly on their way on the up, with two of their most popular releases to date; The Downward Spiral (1994) and The Fragile (1999). Both of these releases gained the band an enormous following and grabbed them sales of over 10 million in the US alone and 20 million worldwide! A triumph for any musician/artist. With their ever growing music career, they have produced so many albums to date, such as their first release – Pretty Hate Machine and Year Zero and more via their first label, but in 2013 came their eighth studio record released on a new sign with Columbia Records and since then the list have been rapidly advancing with; two EPs: Not the Actual Events (2016) and Add Violence (2017) and their latest – Bad Witch… all of which they have received positive reviews and great feedback from their dedicated fan base. Now 30 years since the beginning of their career, Nine Inch Nails have received a vast amount of awards and rightly so, including an impressive thirteen Grammy Awards! As well as awards they have been credited, both as a band and Trent Reznor individually as some of the most influential artists on the entire music scene, spin magazine described Trent as "the most vital artist in music". Come and show your support for them as they take to the road and stop off in Las Vegas this coming Fall season! !